Our Best Selling Package to target unwanted and stubborn weight in the body's Mid-Section. Our Best Selling Package!!! 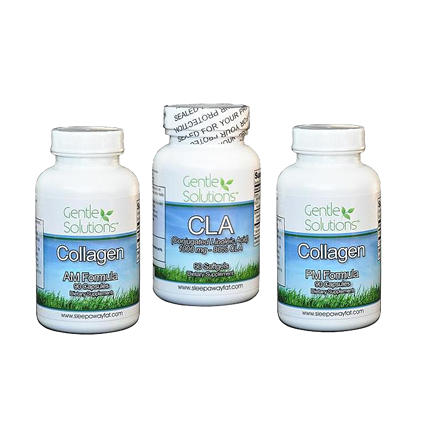 1 bottle of each: Gentle Solutions Collagen AM, Gentle Solutions collagen PM and Gentle Solutions C.L.A. and a complimentary pill box. Stepped on the scale this morning to discover I have lost 12 pounds! I knew my clothes were fitting better but I never imagined I had lost that much! I had to get on the scale 3 times before I believed it!!! Extremely happy with my results with the Tummy Saver after being on it for less than a month. I started with the Starter Kit. In one Month I went down 12 pounds! I lost 2 inches off my waist and I had to go to the Jeweler because my rings were all too big! I had to have my size 10 rings resized to an 8.5. I\'m really happy with the products so far!! Took this package a few years ago and managed to lose 60 pounds! My mother in law was taking it at the time and she lost 90 pounds. She has very easily kept it off, while I\'ve had numerous medical problems which has lead me to gain 15 pounds back. I\'m so happy knowing that these products can once again help me lose those pesky 15 pounds!! Such great products!